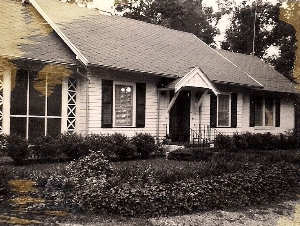 In the 1960’s North Macon was growing with homes being built and new families moving into the community. It was Daniel Sydney Wagnon, Chairman of the Missions Committee of Ingleside Baptist Church, who had a vision of starting a new work to reach the area residents for Jesus. He and the committee located the present church site and purchased 10.5 acres, part of our present property, so that a church could be started. The first Sunday service was held on April 21, 1963 with 41 charter members and quickly grew through the years. On our seventh birthday, Sunday, May 3, 1970, our church held Ground-Breaking Day, with plans to enlarge our chapel so that seating capacity would be more than double that of the original chapel while retaining the same look outside - and for the building of an Educational Building of a little over 8,000 square feet. The new chapel was ready for the service of Sunday, November 18, 1970 and the Education Building was completed January 31, 1971. The current Fellowship Hall was added in 1990. Wesleyan Drive Baptist church has rich history of missions and outreach to the local community. The Baptist Women coordinate several service opportunities such as gifts to the Bolingreen Nursing Home residents at Christmas, rice and canned goods to the Macon Baptist Association's food pantry, and other "as needed items." Baptist Men host a Valentine's Banquet every Friday before Valentine's. The men make all of the arrangements even down to serving the ladies at mealtime. Every Easter finds members bringing flowers from their yards for the Blossoming of the Cross. While the hand bell choir plays each church member files past the old rugged cross to add their own flower to the cross. By the end of the service the cross is blooming with the beauty of Easter. Homecoming is celebrated on the first Sunday in May with a world-famous covered dish supper. July brings Vacation Bible School to Wesleyan Drive. The Sunday night before Thanksgiving will find members gathered around the tables for a Thanksgiving meal and a celebration of the Lord's Supper. This is always a special evening when we reflect on the wonderful blessings we have as a church family. Christmas brings a flurry of Sunday School parties; choir practices, performances, and parties; and decorations in the sanctuary. Every Christmas Eve families gather for the Candlelight Service. Of course, all of these events are above and beyond the faithful Sunday School classes meeting for in-depth study, the spirit-moving morning worship services, the evening services of continued learning, hand bell practice, Awana's, fellowship around the tables on Wednesday night with wonderful cooking, followed by a season of prayer. Learning, growing, and serving opportunities abound at Wesleyan Drive Baptist Church. Thanks for taking a look back at our history. Come join us as we move forward in the ministry God has given us. Photo: The original church, the converted home purchased from the Blake & India Hunt Jones family.